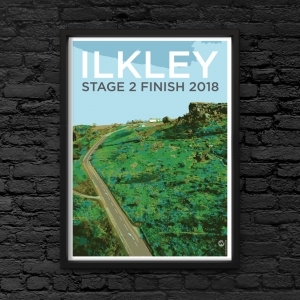 A unique ‘Ilkley’ Poster created by our talented team here at Westbrook Creative, to celebrate Ilkley being the Tour De Yorkshire Stage 2 Finish Town. Available in A3 (297 x 420 mm / 11.7 x 16.5 in) or A2 (420 x 594 mm / 16.5 x 23.4 in) sizes. Limited availability. All profits from the sale of these posters will be donated to Martin House Hospice – www.martinhouse.org.uk a superb charity who provide family led care for children with life shortening conditions. Local Pickup Available from Ilkley, see below for details.